The United Nations says 85 former Farc rebels have been killed in Colombia since the group signed a peace accord with the government two years ago. Most of the murders were by illegal armed groups and drug gangs fighting over former Farc territories, UN chief Antonio Guterres said in a report. Mr Guterres urged Colombian President Ivan Duque, a vocal critic of the peace deal, to do more to protect ex-rebels. Colombia suffered 52 years of conflict until peace was reached in 2016. 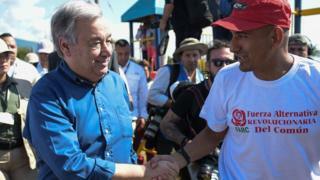 In the last three months alone, "14 ex-members of Farc were murdered", Secretary-General Guterres said in his quarterly report on the UN's mission to Colombia. He also said he was "hugely" concerned that more than 400 social leaders and human rights activists had been killed in Colombia since 2016. "Most of the murders were in zones abandoned by former Farc (fighters) and where there is limited state presence," the UN report said. Since the peace accord, Colombia's weak state apparatus has been unable to take control of these isolated regions. Instead, illegal armed groups have taken over and the security forces and president are increasingly coming under fire for not stemming the violence. The 2016 peace deal, reached after years of negotiations, resulted in some 7,000 ex-fighters laying down their weapons.